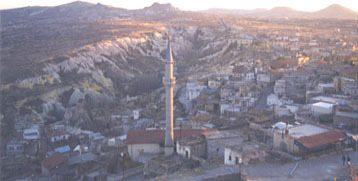 CAPADOCCIA -- A beautiful landscape born from the ashes of the Erciyes and Hasandag volcanos in Central Turkey. 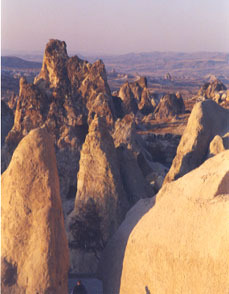 The tuff and the overlying welded tuff formed the fairy chimneys by differential wind erosion. 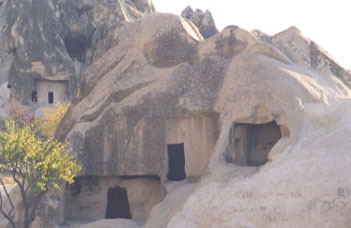 Early monastics carved out the soft tufa to make chapels & churches, while early Christians carved out complex underground cities to hide from Arab raiders. 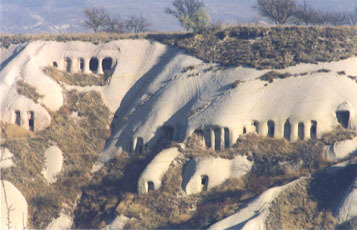 Some of these "caves" are in use today in the town of AVANOS as pottery factories. 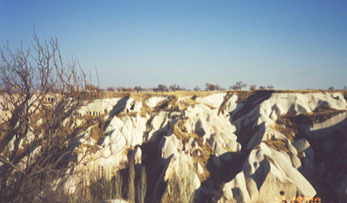 The natural moistness & cool air in the caves provides a suitable environment for drying ceramics. 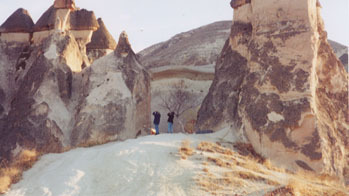 Tufa formations called "fairy chimneys"